Unfortunately I did not get the chance to eat at Guillaume Brahimi's flagship fine dining restaurant, Guillaume at Bennelong, before they closed their doors at the end of 2013. I tried they were all booked out over a month in advance. Oh well, I will need to wait til April when he re-opens in Paddington. For the meantime, I will have to settle for Guillaume's interpretation of the French bistro at the Crown Complex in Melbourne, Bistro Guillaume. I decided to come here for dinner with my work colleagues after a long day of meetings, so Bistro Guillaume would be the perfect location to unwind. The moment I walked into the restaurant, I noticed how close this resembled the French bistro. 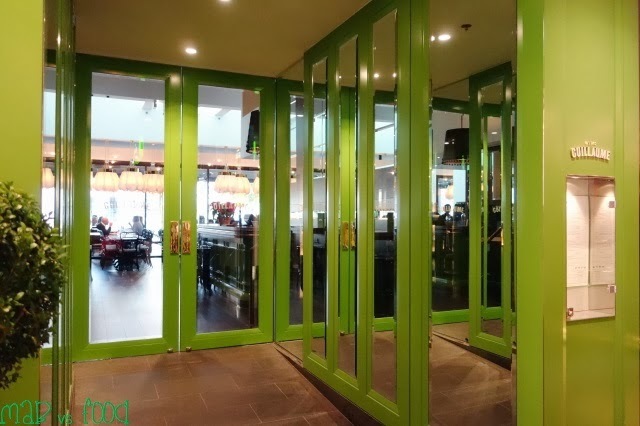 The entrance is bright green. Wooden tables and chairs. Wine glasses, white napkins and large menus on the tables. The specials on blackboard menus. French waiters and waitresses. The list goes on but it's like you have been transported from Melbourne to Paris! 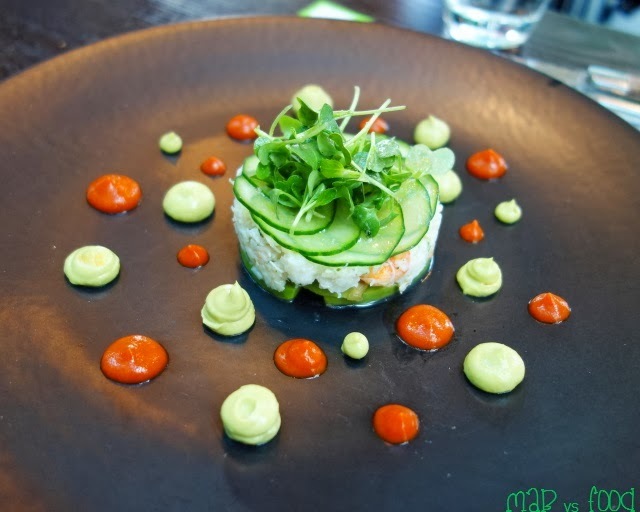 After going through the large place mat menu, the plat du jour (dish of the day) and even more special items on the blackboard menus, I really had a hard time deciding what to have. French food is one of my favourites and there were so many French classics that I wanted to try. I just love how French bistro food is so tasty, rich, comforting and satisfying. I wanted the the onion soup, the chicken liver parfait, the pork and duck rilletes, the escargot, the mussels... I think I am just reading the entire entree section, I want it all hehe. These will have to wait another day. Any way, here's what I did end up trying. Whilst my work colleagues baulked at the sight of raw beef, my eyes light up when I see this French bistro favourite. Presented in a large glistening quenelle, the steak tartare had an amazing combination of flavours from all the different ingredients mixed together. There's capers, gherkins, mixed herbs, dijon mustard, ketchup, Worcestershire sauce and an egg yolk to name a few. Just pure deliciousness! There was a bottle of Tabasco sauce on the table, so I added in several drops of it since I love spice. 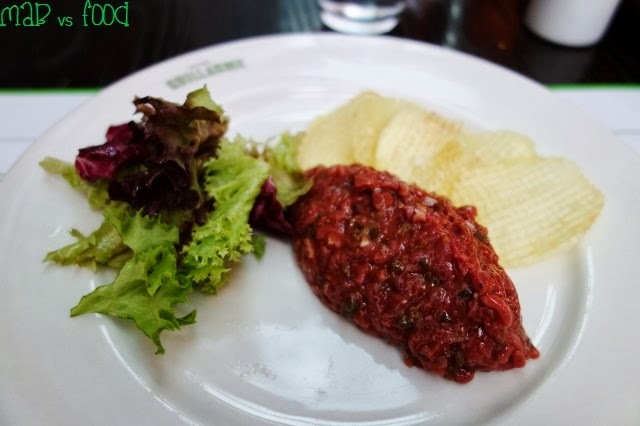 The steak tartare also came with pomme gaufrettes, which were latticed mats of thinly sliced potatoes. These were crispy and a joy to eat with the steak tartare. I did wish I had a few more chips though as I had run out before I was finished. One of my colleagues ordered this dish. It was so beautifully presented on the plate, I had to take a picture of it and include it here. I did not try any of it, so can't comment much on how it tasted although my colleague did say that they enjoyed it. I do not usually go for the pan fried / char-grilled fish option when I eat out for fear of the meat being too dry. 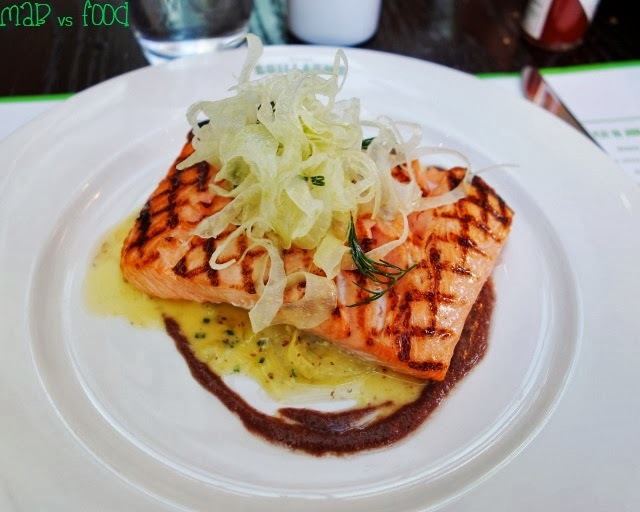 But I decided to go for the char grilled king salmon any way (not sure why). Overall, I thought this was an enjoyable dish. The meat fell apart easily with the stroke of the fork, although I still would have preferred the meat to be a little bit more rare and moist. I did quite enjoy the smokey / charred flavour of the salmon from the grill. There was also a nice balance from the acidity of the lemon vinaigrette and the saltiness of the olive tapenade. 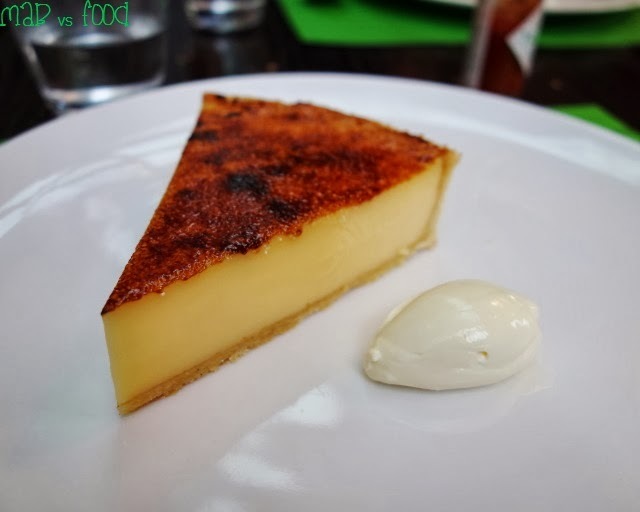 The lemon tart, which is a signature dish at Bistro Guillaume, comes as a massive, massive slice! I think I probably made a mistake in ordering this one for myself, as I noticed a couple of other tables sharing this one. I did manage to finish this one, but required a nice, leisurely stroll around the Yarra afterwards! Other than the generous portion size, I really liked this lemon tart. The lemon curd was thick in size, was quite sweet but nicely balanced by the sourness of the lemon. The texture of the curd was divine - it was smooth, soft and creamy (though quite rich because of the size). I loved the addition of the thin brulee layer. The flavour of caramelised sugar goes well with a sharp lemon curd. The tart also came with a little quenelle of creme fraiche to cut through the lemon curd, although I thought I needed more of it or better yet, a scoop of vanilla ice cream. I really enjoyed my meal at Bistro Guillaume. 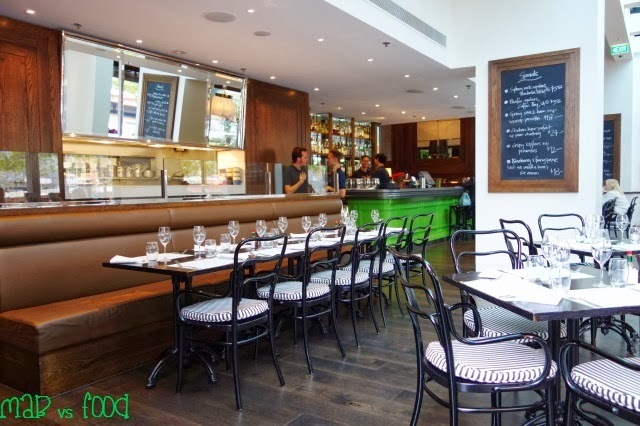 I think this is certainly one of the better French bistros that I have tried in Australia. Amongst many other things, Bistro Guillaume is something else that Melbourne has over Sydney in the dining scene (even Perth has Bistro Guillaume)! Come on, Guillaume please open a Bistro Guillaume in Sydney :) I think we might need to wait for the opening of Crown Casino in Barangaroo for our own Bistro Guillaume (which won't be for many years). Highlight: All the dishes I tried were enjoyable, but I liked the steak tartare the best. Lowlight: I was incredibly stuffed by the end of this meal due to the generous portion sizes, so needed a leisurely stroll afterwards.